On the day of actor Jung Suk Won’s birthday, the ‘Lee Gak and the trio’ of SBS’s “Rooftop Prince” gathered together. Jung Suk Won tweeted on his Twitter account on the early morning of May 16th, 2012, “Thank you very much. Birthday is nothing yet prepared for me like this… Thank you to my parents who gave birth to me. Good night.” He also uploaded a photo. 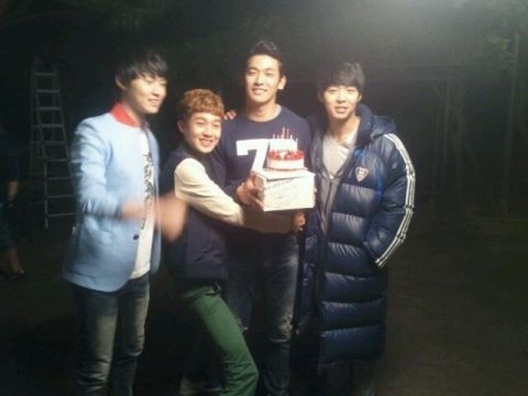 The published photo showed that the henchmen trio of “Crown Prince”, Jung Suk Won, Lee Min Ho, Choi Woo Shik and of course, Park Yu Chun who plays the role of Lee Gak, gathered together to celebrate the birthday of Jung Suk Won, in which Jung Suk Won held a small cake with a happy smile, the bright smile attracted attention. Netizens who saw the photo commented, “Happy birthday, Suk Won”, “Everybody looks very close”, “Down jacket fashion of Park Yoochun that opposite with season”, “Fighting crown prince who has good understanding in work” and so on. On the other hand, May 16th is the birthday of Jung Suk Won.